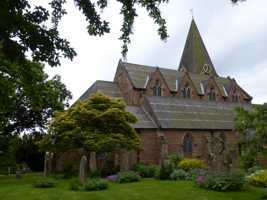 The church is dedicated to St Michael and All Angels, and is listed Grade II. Money was raised in 1789 by John Watson (£10 0s 0d) and others, William Becher, Adam Hough, William Warren, Gilbert Browne, William Smith and John Swift (£5 5s 0d each), towards rebuilding the old church. In 1853 the church had one aisle and a square tower, with 5 bells. The living was a discharged vicarage valued at £165, and had 19a 3r 6p of glebe. The stone church was substantially rebuilt after a fire in 1860-61 at a cost of £2,760, to designs of Messrs Hines and Evans of Nottingham. The lower portion of the tower, probably of 15th century workmanship, is the only portion of the ancient church remaining. Miss Milward left £1,000 towards its rebuilding, the rest was raised by subscription. In the same year an addition was made to the graveyard. A further addition and consecration was made to the graveyard in 1868. The church was extended in 1905 by the addition of an organ loft and a new organ installed, also a south vestry room was added. The church has a tower with spire with 6 bells, a clock with four faces and weather vane. Particular thanks to Alan Wahlers for research on this entry and for the photographs.